Art inspires art. This thought was witnessed first-hand as 21 lucky students of Arts Umbrella’s Pre-Professional Theatre Program visited the big top for an experience that most of us could only dream of. 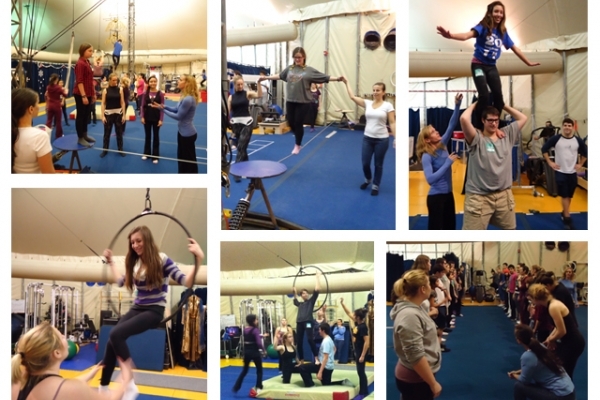 Students spent the day with Cirque du Soleil performers, learning from the best and stretching themselves (mentally and physically) in ways they never thought possible. The relationship between Cirque du Soleil and Arts Umbrella is a beautiful thing. With likeminded thoughts on the powerful potential of kids in the arts, the harmonious connection has grown from support for Arts Umbrella’s Outreach programs to a genuine partnership. From benefit performances and ticket donations, to performer workshops and participation at our special events, Cirque du Soleil’s generosity and engagement has created numerous artful opportunities for the Arts Umbrella community. “Cirque du Soleil believes that the arts have a concrete impact on youth, opening up their potential in a way that other disciplines can’t achieve. Supporting the Arts Umbrella Outreach program is important to give a platform to youth who don’t have access to arts in other places.” Sonia Suave, Social Action Coordinator, Cirque du Soleil.